“The summer’s gone and all the leaves are falling,” lamented Danny Boy’s mother. But where was he going? Perhaps to celebrate Slovenian Wine in and around St Martin’s Day (or planning a November visit to Slovenia?) ?Slovenian wine – what a beginner needs to know. And what to bring home to your mum (if she must bide). Let’s begin with a celebration. 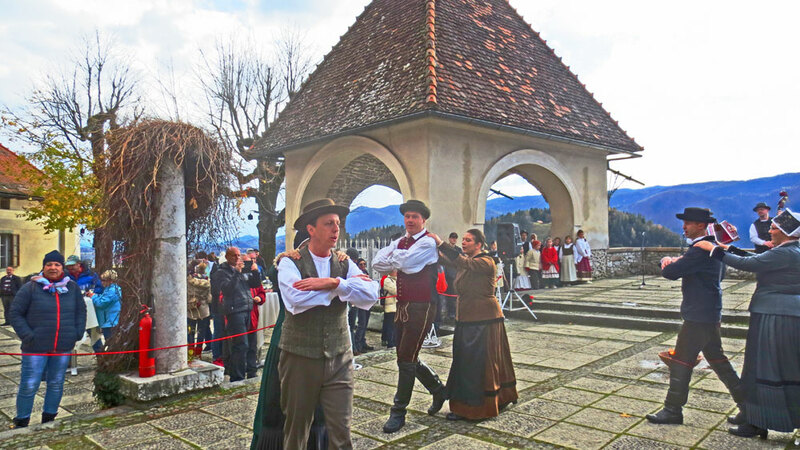 The annual celebration of Slovenian wine is held throughout the country on 11 November – St Martin’s day. St. Martin is the patron saint of wine makers and on that day (and for a few days before and several days afterwards, the best new Slovenian wine is celebrated around the country. Traditionally it is the day that the grape must turns to wine. In some restaurants before that date you can buy a glass of must (try Pension Mlino). Throughout the country the day will be marked by events called Pot Sv. Martina (St Martin’s way or St Martin’s route). Wine growers set up stalls, glasses can be hired and for a reduced price you can sample as many wines as you like Each event is organised in a slightly different way. You usually hire out a wine glass, sometimes you pay a set price, sometimes you buy tickets. Simple food is cooked on site. Often there is music and entertainment. The atmosphere is always happy and friendly. In 2018, St. Martin’s day will be celebrated above the lake in Bled Castle, beside the lake in Spa Park. There will be events in Kranj and in Ljubljana, too. And, further afield especially in the wine growing regions. Stalls will have samples of wine and Slovenian food. Because of the weather, of all the times to visit Bled, Gorenjska, Ljubljana, early November is not the most appealing. The vast bulk of tourists have gone, the sky is often cloudy. The weather can be stormy. 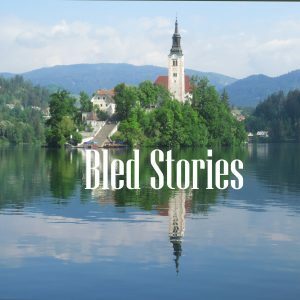 Hear about wine tasting events and some of the best pubs in Ljubljana in the Bled Stories podcast. What happens? The 2018 St Martin’s Day celebrations will (weather permitting) be held in Spa Park on 11 November. Wine growers will set up stalls and offer tastings. If you like what you taste and want to buy, there is a big selection to choose from. Then there is the food – simple, warming, and traditional made there and then. It’s like a friendly polite drinks party, but everyone’s well wrapped up against the elements. 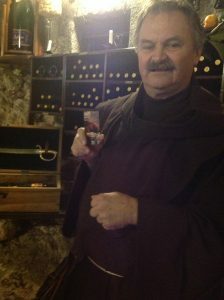 You can choose wine from the cellar in Bled Castle all year round. And they don’t always mess around with corkscrews. Sometimes a sword does a better job – the bottle’s neck is swiftly and efficiently sliced off. The St Martin’s Day celebration is on the upper terrace, more wine, more food, music and entertainment including traditional dances. Get there early. This is a really special event. Unless there is a special event, or you are with a guided tour, you can’t get access to the city’s famous ancient catacombs. That is where Pot Sv. Martina is held. As the event can attract more than 3,000 people each year, you must book in advance with Kranj Tourism. Another open-air event which can fall foul of the vagaries of the weather, the Ljubljana Wine Route is held over and around the and along Stritarjeva ulica up to the City Hall. Scores of stalls from all over the country with wine, hot food and all sorts of other tempting buy-ables are available. All these celebrations are held around 11 November – sometimes the weekend before or after. As they are outdoor events, they will be subject to weather. Check with the organisers before going. Slovenia’s second city, Maribor, is the centre of some of the biggest celebrations of St. Martin’s Day. This is the home of the oldest vine in the world. At more than 400 years old, the Old Vine is a symbol of the rich wine culture of Maribor, Styria, and all of Slovenia. There is a cutting of the vine growing in Bled Castle. On St. Martin’s Day there is a “ceremonial christening of must” to mark the change into wine, the arrival of the wine queen. Trg Leona Štuklja in the city centre, is the place to find wine tastings, food, music and entertainment. Maribor is also a perfect starting point to follow the Wine Roads here any time of the year. Look especially at the Jeruzalem Wine Route. 10 years ago – March 2008 – British wine writer Jancis Robinson was one of the first people to bring Slovenian viniculture to the general consumer in an article for the Financial Times. 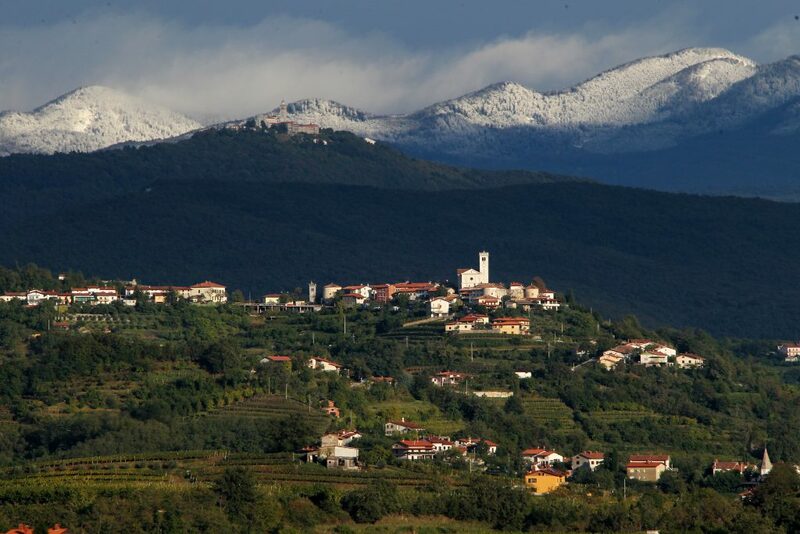 Most of the wineries she visited were at the western side of the country bordering Italy on the dramatic slopes of Brda. If you are a wine aficionado, you might find what Jancis Robinson recorded useful. 150 notes can be found here at Jancis Robinson’s website. Here, bordering Croatia and Hungary in the east, is where I began my exploration of Slovenian wine. 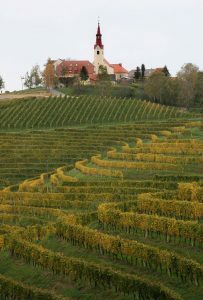 Podravje is Slovenia’s largest wine region. Here you will find lots of varieties of white wine (barely any red is produced) along with sparking and dessert wines. Here you will find Prekmurje and Štajerska wineries. We’ve moved south from Podravska, but not far. This time on the border of Croatia, you will find the Bizeljsko Sremič, Dolenjska , Bela Krajina districts. Some 10 million litres are produced here each year even though it is the smallest of the wine producing regions in Slovenia. A wine you are unlikely to find outside Slovenia and popular locally is Cviček from the Dolenjska area. And his infectious enthusiasm continued through the reds and the blends and the accommodation too. The grapes for this normally sweet dessert wine have been frozen while on the vine. The water in the grapes freezes, but the sugars don’t, leading to producing less juice and a sweet wine which more (sometimes very much more) expensive than ordinary white wine. The harvest is in the winter, even well into January. A good example of ice wine that won’t break the bank is Černko Laski Riesling from Jareninsk near Maribor. The 2005 Vintage won a silver award at the San Francisco International Wine Competition in 2006. If you enjoy sweet wine, a more recent award – 2015 – in the Decanter World Wine Awards was the Ptujska Klet, Pullus Laski Riesling, 2012. It won and international trophy for sweet wine over £15. All the supermarkets and grocery stores have a selection of wines – often the smaller shops have a small but good range. Shop wine ranges from very cheap (depending on your experience, but certainly in UK terms almost unbelievably cheap). They are rarely expensive. Specialists shops – there are at least three in Bled – will have a more sophisticated range. In the shops and restaurants look out for these names. I can’t recommend any one in particular (I am not an expert and I don’t know what you like), but these are my order of preference. My preference at home in red and in Slovenia is white. 75% of Slovenian wine is white. Malvazija, Šipon, and Rebula (Ribolla Gialla in Italy) are my usual picks. The reds you will see in supermarkets are Merlot, Refošk, Cviček, and Teran. I tend to think Teran is something of an acquired taste. Experiment if you are buying off the shelf in a grocery store. The wine is good and you won’t waste your money. In a restaurant ask advice. The Slovenian wait-staff are always proud of Slovenian wine and happy to talk about it. There are a few specialist wine shops in Bled. 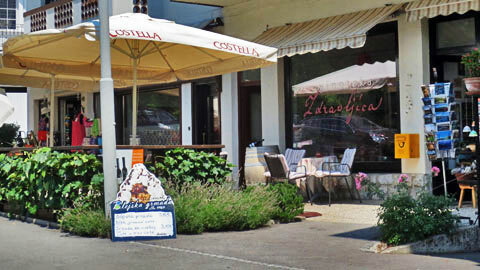 My own favourite is Vinoteka Zdravljica (here’s a link on Google Maps) where you can sit and try before buying. The staff are lovely and want you to enjoy their wine. The cellar in Bled Castle is a unique experience where you can do more than just buy wine – you can learn about viniculture, too.